In March the world watched anxiously for a puff of white smoke and announcement: "Habemus papam." The election of a new Pope from the new world inspired Jane Carpenter, Library Special Collections Rare Book Cataloguer, to exhibit rare texts of Papal provenance. The six books selected, "our treasures, really" were a small "representation of items from our collection," she said. The Obeliscus Vaticanus Sixti V Pont. Opt. Max. (Rome: Bartolomeo Grassi, 1587), pictured below, is a case in point. "The book is composed of commentaries, engravings, poems, and epigrams celebrating the re-erection of the Vatican Obelisk in front of St. Peter’s Basilica by Pope Sixtus V in 1586. 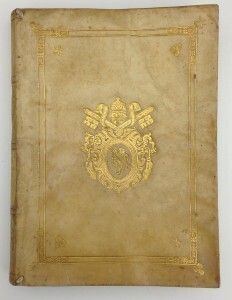 Our copy was specially bound for Pope Sixtus (1585-1590) whose papal arms are stamped in gilt on the vellum cover." The Obeliscus Vaticanus Sixti V Pont. Opt. Max. More remarkable is the Il Corelio (Padua: Paolo Frambotto) by Giacomo Zabarella. Jane described this priceless Library Special Collections item, ex libris Pope Gregory XII (1406-1415), as the "sole edition of an illustrated account by a genealogist living in Padua, of the origins of the powerful Correr family of Venice, apparently representing an attempt to link them to the Este (and Zabarella) lineages. The author traces the Corrers back to Japhet, third son of Noah." And, as proof that Vatican controversies are nothing new, Jane noted that LSC has first editions of Pietro Bembo’s Gli asolani (Venice: Aldus Manutius, 1505). Two states of this book exist and the Library owns both, ex libris Pope Julius II (1503-1513). Jane recounted, "The first copies off the press of the 1505 edition included Bembo's dedication to Lucrezia Borgia. However, during the course of the printing, a feud arose between the new pope Julius II and Lucrezia's husband, the Duke of Ferrara. Since neither Bembo nor Aldus, both loyal to the papal court, wished to present a book paying homage to the wife of an enemy of the Pope, the dedication was immediately removed, from the remaining copies of this edition, as well as those of all later editions."